Preparation time: 5 minutes once potatoes are cool to touch. Cooking time: 15–20 minutes. Leave skins on potatoes. Place potatoes in a medium saucepan and add enough cool water to cover them by at least an inch of water. Bring to a boil and cook until potatoes can be pierced with a fork, about 15 minutes. Drain and cool. Quarter the potatoes when cool enough to touch. Combine bacon bits, salad dressing, Splenda, vinegar, and parsley in a medium-size bowl. 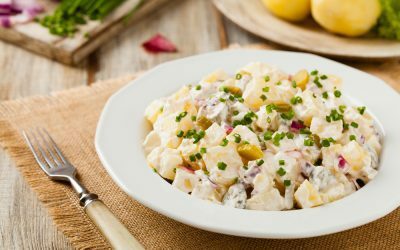 Toss potato pieces in bowl with dressing to coat. Serve warm or chilled.